Avulsion fracture by definition is a bone fracture which occurs when a fragment of bone tears away from the main mass of bone as a result of physical trauma. Avulsion injury of ossicular chain is not a common clinical entity in otological practice. Ossicular chain injuries are commonly encountered in head trauma following road traffic injury, accidental fall, blast injury, or direct injury. 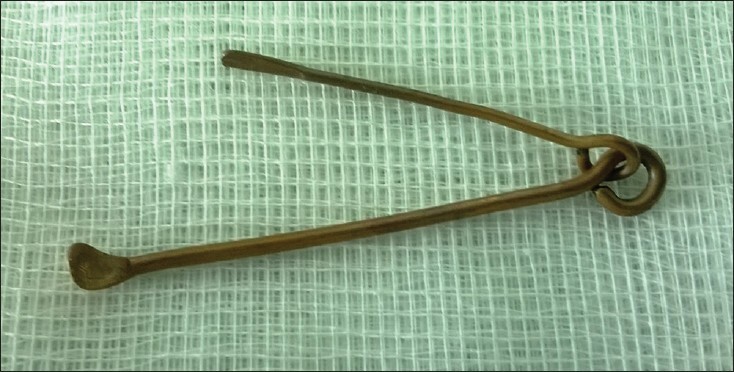 However, a common practice of wax removal in certain parts of rural India and other parts of the world, by using a locally manufactured ear hook or spatula can also be a major cause of ossicular injury although such cases have not often been reported in English literature. Types of ossicular injury mentioned in literature are fracture, fracture dislocation, disarticulation, and dislocation; but not avulsion injury. Here, we present one such case of avulsion injury of malleoincudal complex without fracture, but with dislocation into the inferior mesotympanum with severe conductive deafness inflicted by a locally manufactured ear hook in adults. Such injuries are difficult to manage in a primary care center setting, and hence, could be prevented by increasing patient awareness and by performing reconstructive surgery whenever possible to overcome the conductive deafness. 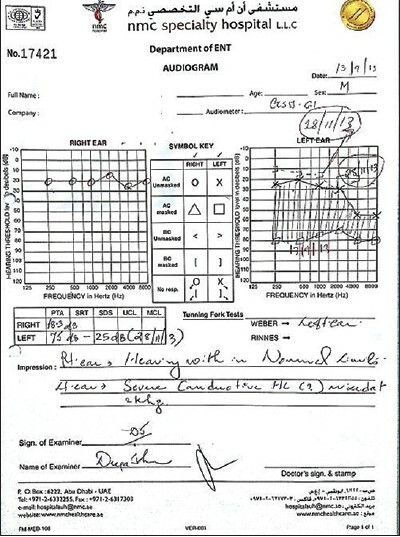 Mr, S KSK, a 30-year-old young Indian, male patient visited the Ear, Nose, and Throat (ENT) Clinic of NMC Specialty Hospital, Abu Dhabi on 13 th September 2013 for complaints of sudden left-sided ear blocking, hearing loss, and tinnitus which happened 4 months ago following insertion of an ear hook by his 5-year-old son. This is a specially designed ear hook [Figure 1] that his father and mother sometimes use for cleaning their ear. This instrument fascinated the child and he reproduced the same action on his father while he was asleep. As the child introduced this instrument deeply and forcefully into the left ear canal; his father developed severe ear pain, jerked suddenly, and turned his head away from the direction of the injury. He consequently had ear bleeding, pain, giddiness, blockage, and deafness of the left ear and took treatment in a local hospital. Clinically, the acute stage of pain and giddiness improved, but deafness and tinnitus persisted. An ENT examination of left ear on 13 th September 2013 in our hospital showed localized granulation tissue in the posterior superior meatal wall and the attic, with an anterior superior moderately-sized central perforation, while the visualized part of the tympanic membrane appeared dull. Audiogram showed 75 dB conductive deafness with flat curve on left side. Computed tomography (CT) scan of temporal bone revealed inferior and external displacement of the left malleoincudal complex into the mesotympanic region. There was loss of normal alignment of the left malleoincudal complex which was lying abutting the inner aspect of left tympanic membrane. The left stapes and its foot plate were found in their normal position. Dislocation of the left incudostapedial joint was noted. There was abnormal soft tissue density lining the inner aspect of left external auditory canal. The left mastoid showed normal aeration. There was no evidence of fracture. The right ear ossicles showed normal alignment [Figure 2] and [Figure 3]. Tympanoplasty surgery was done on 29 th September 2013 under general anesthesia (GA) via endaural approach. The various steps of surgery consisted of removal of granulation tissue, elevation of tympanomeatal flap, and removal of avulsed malleoincudal complex which was found lying in the inferior mesotympanum [Figure 4]a and b. Sheehy's partial ossicular replacement prosthesis (PORP) was fitted into the head of the stapes supported by tragal cartilage [Figure 4]c. Tympanic membrane perforation was repaired with temporalis fascia by underlay technique. Postoperative period was uneventful. Postoperative hearing improvement was remarkable with AB gap closure of up to 10 dB 2 months post-surgery [Figure 5]. The various known ossicular chain injuries are incudomalleal or incudostapedial joint separation, dislocation of incus, dislocation of the incudomalleal complex, dislocation of stapediovestibular complex, and fracture of the ossicles. However, dislocation is the most common injury and occurring more often than the fracture. Incudostapedial joint separation is the commonest injury of all the other ossicular chain injuries. 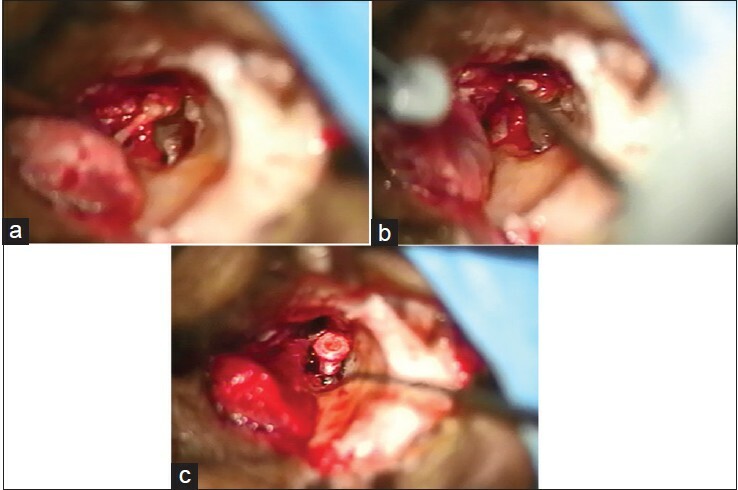 , Malleus and stapes are relatively more stable than the incus and very rarely affected. Saito et al.,  further proposed that in certain types of injuries the vulnerable incus may rotate posteriorly along the long process and is pushed into the external auditory canal. The commonest form of trauma reported in the literature is skull trauma, which is frequently due to road traffic accidents, blow to the temporal, parietal, or occipital area with or without fracture of the temporal bone. , Direct trauma via external auditory canal with an ear hook is expected to be seen in the pediatric age group. Lasak et al.,  reported 44 cases of middle ear injury through external auditory canal, but none had an avulsion injury. In our present case, a specially designed ear hook having a claw in one end and a probe at the other end was used by a 5-year-old child to clean the ear of his father while he was asleep. The claw of the ear hook must have hooked around the malleoincudal joint avulsing the ossicles by lateral traction of father's sudden counter motion and thus dislocating into the mesotympanum. This is a very rare form of injury and has not been reported earlier in English literature to the best of our knowledge. Symptomatically, ossicular chain injuries are associated with conductive, sensorineural, or mixed hearing loss depending on ossicular disruption or labyrinthine damage. , Traumatic ossicular lesion is usually associated with longitudinal fractures of temporal bone and is present in almost 20% of the cases of head trauma. , Hasso and Ledington  reported that up to 50% of temporal bone fractures are associated with ossicular injury. Tos  found 67% of patients with hearing loss immediately after head trauma of which 59% had conductive deafness. Persistent conductive hearing loss is found in 15-20% of patients with fracture. Brodie and Thompson  reported 21% of patients with documented conductive hearing loss after temporal bone fractures. Wolf et al.,  reported 12 (5.7%) ossicular lesions in 210 ears exposed to blunt trauma. However, hearing loss caused by direct trauma through external auditory canal in the present case was severe conductive deafness of 75 dB with minimal vestibular symptoms of 1-day duration. This may be due to noninvolvement of stapedial foot plate or its superstructure. Clinically, it is difficult to diagnose which ossicle of the ossicular chain has been involved due to trauma, but Yetiser et al.,  mentioned that isolated malleus injury is mostly associated with a small conductive hearing loss. Stapedial damage is usually associated with a balance problem. Ossicular chain injury with dislocation is best diagnosed with high-resolution CT (HRCT) if it is done after resolution of middle ear edema, effusion, or hemotympanum. The presence of the 'Y" sign on the coronal high resolution CT of the temporal bone shows lateral displacement of the incus. , Whereas, incudomalleolar articulation is well-visualized on axial CT scan and the configuration of this articulation is described as the "ice cream cone". Displacement of the "ice cream cone" corresponds to the head of the malleus away from the cone (which resembles the body) and short process of incus, indicative of disarticulation. Disruption of both incudomalleolar and incudostapedial articulation should be suspected radiologically if the space between the articulation surfaces of the incus and malleus has increased. This information is important from a surgical point of view. There are many types of tympanoplasty surgeries for traumatic ossicular pathology depending on the type of injury and location of the ossicles. A cartilage graft, cortical bone, temporalis fascia, silicon splint, fibrin tissue, and adhesive have been reported to connect the stapes to the incus. ,, Mundada et al.,  reported air-bone gap closure within 10 dB in 80.3% of patients with facial arthroplastic ossiculoplasty in cases of incus dislocation. Mills and Starriit  reported their results on physiologic repositioning of dislocated incus with stabilization of the incudostapedial joint by silicon splint in six patients with traumatic injury. However, we have no information regarding the severity of dislocation; whether the incus is totally dislocated to another place or just dislocated with incus body and short process is still in the normal position in attic. In the present case, the malleoincudal complex has been avulsed completely and dislocated to the inferior mesotympanum; and additionally, there is presence of posterior-superior canal wall granulation and a moderate sized central type of perforation. Stapes was totally intact. Hence, it was decided not to use the dislocated malleoincudal complex for ossicular reconstruction for fear of stability and viability. Reconstruction of the ossicular defect was performed by fitting Sheehy's PORP on head of stapes with cartilage. Tympanic membrane perforation was repaired with temporalis fascia graft by underlay technique. Hearing improvement in our patient with this technique of ossiculoplasty was found to be good with significant hearing improvement and with air-bone closure within 10 dB 2 months post-surgery. The treatment plan should also include patient counseling to prevent such injuries. 1. Hasso AN, Ledington JA. Traumatic injuries of the temporal bone. Otolaryngol Clin North Am 1988;21:295-316. 2. Ghorayeb BY, Yeakley JW, Hall JW 3 rd , Jones BE. Unusual complications of temporal bone fractures. Arch Otolaryngol Head Neck Surg 1987;113:749-53. 3. Saito T, Kono Y, Fukuoka Y, Yamamoto H, Saito H. Dislocation of the incus into the external auditory canal after mountain-biking accident. ORL J Otorhinolaryngol Relat Spec 2001;63:102-5. 4. Jakse K, Jakse R. Diagnosis and therapy of stapes fractures and luxations. Laryngorhinootologie 2002;81:87-92. 5. Podoshin L, Fradis M. Hearing loss after head injury. Arch Otolaryngol 1975;101:15-8. 6. Lasak JM, Van Ess M, Kryzer TC, Cummings RJ. Middle ear injury through the external auditory canal: A review of 44 cases. Ear Nose Throat J 2006;85:722, 724-8. 7. Stephan AL, Isaacson JE. Incudomalleolar joint separation. Am J Otol 2000;21:284-5. 8. Choe KS, Arigo J, Zeifer B. Stapediovestibular dislocation. Otol Neurotol 2002;23:102-3. 9. Cannon CR, Jahrsdoerfer RA. Temporal bone fractures. Review of 90 cases. Arch Otolaryngol 1983;109:285-8. 10. Tos M. Prognosis of hearing loss in temporal bone fractures. J Laryngol Otol 1971;85:1147-59. 11. Brodie HA, Thompson TC. Management of complications from 820 temporal bone fractures. Am J Otol 1997;18:188-97. 12. Wolf M, Kronenberg J, Ben-Shoshan J, Roth Y. Blast injury of the ear. Mil Med 1991;156:651-3. 13. Yetiser S, Hidir Y, Birkent H, Satar B, Durmaz A. Traumatic ossicular dislocations: Etiology and management. Am J Otolaryngol 2008;29:31-6. 14. Lourenco MT, Yeakley JW, Ghorayeb BY. The "Y" sign of lateral dislocation of the incus. Am J Otol 1995;16:387-92. 15. Wennmo C, Spandow O. Fractures of the temporal bone - chain incongruencies. Am J Otolaryngol 1993;14:38-42. 16. Mundada PS, Dasgupta KS, Tapadiya GB. Temporalis fascia assisted ossicular arthroplasty for the dislocated incus: Fascial arthroplastic ossiculoplasty. Laryngoscope 2002;112:1699-702. 17. Adamson RM, Jeannon JP, Stafford F. A traumatic ossicular disruption successfully repaired with n-butyl cyanoacrylate tissue adhesive. J Laryngol Otol 2000;114:130-1. 18. Mills R, Starriit N. Management of incus dislocation by physiological repositioning of the incus. J Laryngol Otol 2002;116:589-92.